The Government & Military (Gov/Mil) market for satellite communications remains optimistic, with nations across the globe doubling down on defense spending to drive their own civilian and military government capabilities. Satcom will continue its rise as a central element here, as more governments move towards network centric asset deployments with data-intensive processes. At close to 30% of the Gov/Mil satcom retail revenue pie in 2017, Unmanned Aircraft Systems (UAS) have quickly grown in prominence as a major component in Gov/Mil operations, with applications in Intelligence, Surveillance and Reconnaissance (ISR) and weaponized combat missions. 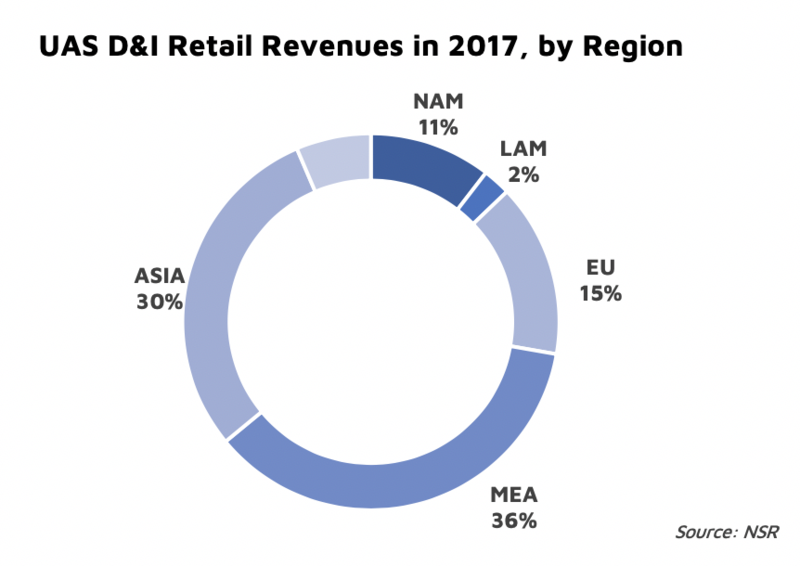 A deep dive in the market in NSR’s UAS SATCOM and Imaging Markets, 5th Edition report pegs the global UAS SATCOM market at nearly $1.5 billion in retail revenues in 2017, with over $23 billion in cumulative revenues forecasted over the next ten years. While the adoption of drones for border/homeland security and humanitarian/disaster relief operations has risen, long endurance UAS missions for Defense & Intelligence (D&I) applications are the major driver for satellite communications. An investigation based on data from the U.S. Central Command and The Bureau of Investigative Journalism revealed that the present U.S. regime launched more strike sorties since 2017 in Yemen, Somalia and Pakistan than the previous Obama administration did in its initial years. 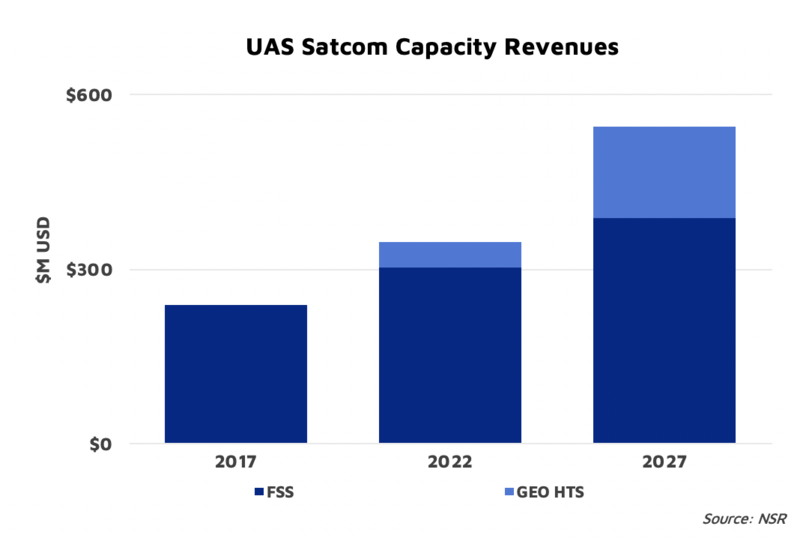 The increasing presence of UAS in these regions in response to escalating conflicts will drive SATCOM capacity revenues for D&I applications throughout the forecast decade, growing at a CAGR of 7.8% through to 2027. Multiple governments continue to seek regionally-developed aerial assets: Spain most recently announced interests in the Franco-German effort to develop the Future Combat Air System (FCAS): a “system of systems” combining myriad manned/unmanned elements together. Meanwhile, loosened export restrictions on the marketing/sale of Unmanned Combat Aerial Vehicles (UCAVs) by U.S. companies under the Trump Administration have fueled competition amongst the traditional UAS players: Israel’s IAI, for instance, lost two huge deals with Australia and Belgium to General Atomics. On the other hand, China has managed to position itself as a go-to exporter of UAS capabilities, selling to governments in Africa and the Middle East. Its flagship Wing Loong and Caihong airframes, often compared to the American MQ-1B Predator and MQ-9 Reaper drones have allowed China to fill in a gap left open by U.S. export policies in the past. In terms of capacity, FSS Ku-band is expected to remain the major play for SATCOM during most of the coming decade, due to compatibility with existing airframes and budgetary limitations for retrofits. Accounting for around 50% of the capacity revenue market share by 2027, FSS Ku-band will endure as the largest segment of the capacity demand despite an impending transition towards High Throughput Satellite (HTS) capacity. This transition is expected later in the forecast decade as newer systems come online and meet the demands of increasingly complex and bandwidth-heavy mission profiles. On the technology front, platform modifications continue to push for miniaturization: reducing the size, weight and power (SWaP) of UAS subsystem components while remaining uncompromising on performance. Compact beyond line-of-sight (BLOS) terminals and phased array antennas represent a next-generation shift in UAS SATCOM capabilities that will drive the market for less expensive Low-Altitude-Long-Endurance (LALE) platforms, which present a tactical advantage over Medium-Altitude Long-Endurance (MALE) airframes, and are also easier to deploy. The UAS market opportunity will continue to move upwards for SATCOM, driven by bandwidth hungry drone applications. However, like most markets, this too is far from impervious to black swan events; ethical/legal considerations around civilian casualties from increased UCAV usage could just as well prove to be a significant restraint in the future. That said, as tactical operations become increasingly network-centric and more countries join the ISR/combat UAS capability club, the capacity demand for “pattern-of-life” aerial intelligence and command/control operations is rising. With UAS positioned as a key differentiator in military doctrine around the world, globally shifting geopolitical concerns and an improving technology landscape will continue to drive this demand for satellite capacity in the high skies.